Storage bucket for equilinBALANCER with measure cup. Especially developed for horses who do not get much exercise or don’t need extra energy and primarily feed on forage: EquilinBALANCER. It regularly happens that forage is not complete. Specifically the minerals selenium, zinc, copper and sodium are reduced available or missing completely in forage. Feeding only forage to the horse therefore is unsuitable and the diet will have to be completed. We can complete the horses’ diet with the available concentrates (cubes and muesli’s), but these often contain too much energy. The amount of extra energy required is directly related to the amount of work the horses do. Most horses fit in category I, e.g. most horses are worked for one (1) hour a day at Medium level dressage. Feeding extra concentrates to these horses is not necessary and will only lead to unwanted behaviour and a higher risk of getting medical problems, for example Insuline Resistance (IR). A highly concentrated vitamin- and mineral supplement like EquilinBALANCER can help. 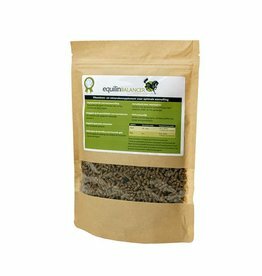 When horses do more work, EquilinBASIC or EquilinIMMUNO are good additives to the feed rations. Other concentrated feedstuffs in turn can then be minimised and only fed when the horse requires more energy.